^ Bowles, Lawrie (1984) . London Transport Buses (8th ed.). Harrow Weald, Middlesex: Capital Transport. pp. 34–35. ISBN 0-904711-54-4. ^ Blacker, Ken (1995) . Routemaster: 1954–1969. 1 (2nd ed.). Harrow Weald, Middlesex: Capital Transport. pp. 134–139. ISBN 185414-178-3. ^ a b c Blacker, Ken (1992). 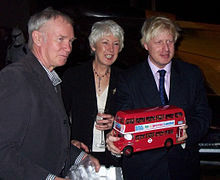 Routemaster: 1970–1989. 2 (1st ed.). Harrow Weald, Middlesex: Capital Transport. pp. 48–49, 56–61, 132–133. ISBN 185414-142-2. The Front Entrance Routemaster: the "Fruitmaster"